The current price of Karbonn A40 is Rs 3499. 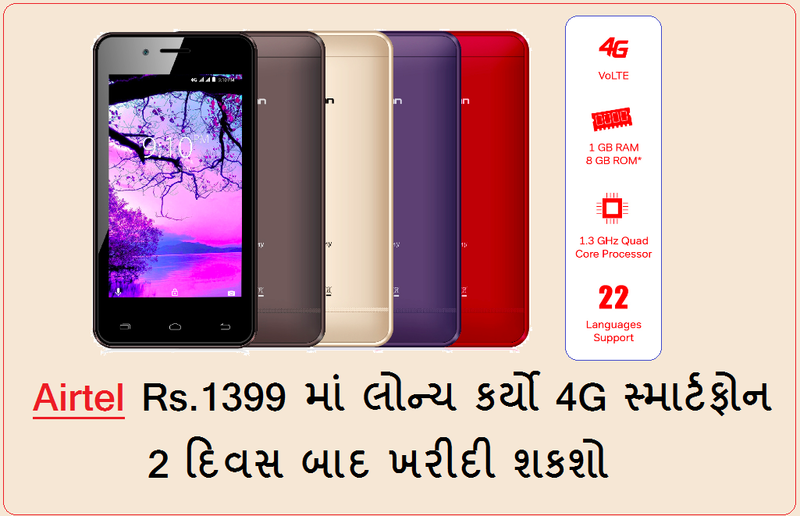 But Airtel has offered this mobile at an effective price of Rs 1399. It is a smartphone, not feature phone so it is expected that it will hit the market. How to Get Refund on Karbonn A40 Rs 1399 Mobile? Airtel says its 'My Pehla 4G Smartphone' initiative, also called 'My First Smartphone', is aimed at "enabling every Indian to buy a 4G smartphone and get on the digital superhighway." Airtel added that the initiative will bring "highly affordable bundled 4G smartphone options and the digital aspirations of millions of Indians." Smartphones under the initiative will be available from offline stores, with after sales being handled by the device manufacturers themselves. The telecom operator detailed just how the Karbonn A40 Indian, which was launched in July and has said currently has a market price of Rs. 3,499, will be available at an 'effective price' of Rs. 1,399 Customers will need to make a down payment of Rs. 2,899 for smartphone, and then make a minimum amount of recharges over the course of three years to receive cashbacks totaling Rs. 1,500 Subtracting the cashback from the down payment for the phone is a 'effective price' of the Rs. 1,399 The 'cash refunds' will be made in the form of payments to the user's Airtel Payments Bank account. The obvious catch here is of course the minimum recharges are available for the above mentioned cashbacks. Users will need to make recharges worth at least Rs. 3,000 in the first 18 months to avail a Rs. 500 cashback, and then make recharges worth at least 18 months to avail a Rs. 1,000 cashback Users will have to make recharges every month. While Airtel's users can make recharges of any denomination, the company is offering a bundled plan of Rs. 169 per month to ostensibly simply the eligibility Rs. 169 over 36 months totals to Rs. 6,084 The Rs. 169 recharge has a 28-day validity, and offers unlimited calling policy and 0.5GB of high-speed data a day. For handsets other than the Karbonn A40 Indian, the plan will have a 14-day validity. Airtel says the Karbonn A40 Indian smartphone will be "completely with the customer, and there is no need to return the device to Airtel / Karbonn at any point to claim the cash benefit." In its press statement, announcing the initiative, Airtel was quick to point out that Karbonn A40 Indian (and include the other smartphones), Google Play Store, and popular apps like Facebook, WhatsApp, and YouTube, Jio phone has been criticized to be missing It's also touting the dual-SIM slots and full touchscreen experience. Raj Pudipeddi, Director - Consumer Business & CMO, Bharti Airtel said, "As the market leader and pioneer of 4G services in India, Airtel's aspiration is to be digitally empower every Indian with high speed data access. Barriers to smartphone adoption and enable millions of Indians to leapfrog to a full touchscreen smartphone experience. We plan to partner with multiple manufacturers to bring affordable smartphone options to the market and build an 'open ecosystem' of low cost devices. in our ongoing tour to deeply understand customers and bring innovation that delights them. " 0 Response to "Airtel Offers 4G SmartPhone at Rs 1399"